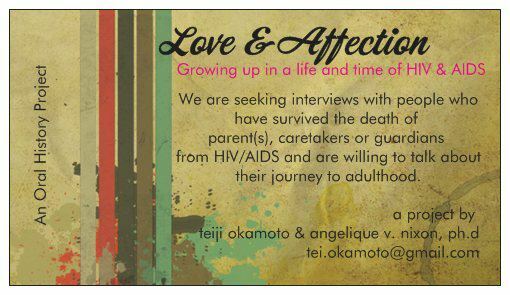 The Love and Affection Project will be a radical oral history archive to explore and record the lives of those who were affected by the epidemic as a child and/or young adult and lost parents/guardians/caretakers to AIDS-related complications. We seek to hear, record, and remember the stories and events that shaped a young person, now grown, whose parent, guardian, or caretaker died of HIV/AIDS. While the project is currently based in the United States, many of the voices included reflect an international and transnational experience. Angelique V. Nixon, Ph.D. and Tei Okamoto work actively in various communities and are dedicated to social change. They are invested in contributing to the oral history archive of the HIV/AIDS epidemic. The directors have engaged in preliminary research through talking with people living with HIV who have adult children. Furthermore, both of them have been affected by HIV/AIDS – losing loved ones, caring for loved ones, and one of them (Angelique) lost a parent to AIDS in 1996. The impetus for this project grew out of our longing to disrupt the invisibility (by choice or circumstance) and silence surrounding HIV/AIDS and death. Therefore, we recognize and privilege voices from communities that are marginalized due to poverty, class, race, gender, sexuality, migration status, and mental health – and across the intersections of these. We are an international partnership representing these communities in various ways personally and politically, and we also have professional experience in building and sharing radical archives. Therefore, our investment in this project is multifaceted. These stories are an incredible opportunity to contribute to the unsilencing and destigmatizing of HIV/AIDS. We hope to also connect a second generation of people affected by the HIV/AIDS epidemic to each other and to provide a space for sharing their experiences. Please get in touch with us if you or anyone you know may want to share their story.